Google Chrome has gained popularity over the years, it is the most widely used Web browser, since it is easy to use, has a simple interface, syncs mobile and other devices without much ado. Not only this, Google Chrome supports many web extensions which, you can easily get them from Chrome Web Store. Here we list the best Productivity extensions that will help you to perform various tasks. Note: Extensions may slow down your browser, therefore use the ones that are needed. Stop worrying about remembering passwords. Use TweakPass Google Chrome extension to secure your passwords in a Vault and keep them safe from intruders. Plus, access your sensitive data like card details, username, passwords etc. at your convince anytime, anywhere. TweakPass is SSL secured i.e. it provides enhanced security from cyber threats. This Chrome extension uses HMac and PBKDF2 SHA-256 for securing you data. No more worrying about annoying ads, with Stop All Ads best Google Chrome extension you can avoid receiving irrelevant and unwanted ads/content. It even blocks malware URLs, disables social media buttons that force you to share what you are reading. Plus, you can apply filters to limit the ad visibility. Bothered by ads, want to get rid of them? Worry not with AdBlocker Ultimate extension you can completely remove ALL ads and can focus just on the web page content. With this, you can remove all ads, block malware and web page tracking. Plus, it improves browser performance and can add “acceptable” ads to the whitelist ads from selected websites. It is amongst the most popular adblocker Google Chrome extension and is used on over 100 million devices. You can block the intrusive ads from spoiling your browsing experience. AdBlock Plus is easy to setup, loads presets filter lists and allows to block almost all the ads. You can also set filters for malware and social media buttons. Custom filters can also be set and AdBlock Plus allows “non-intrusive advertising” through filters. Note: Many ad blockers don’t block all ads, and some websites including this one. The ads to pay bills are allowed to be displayed they aren’t blocked by ad blocker extensions. Make today the most productive day with Ultidash most powerful extension. Using it you can add something new to your tab. You can customize your to do list, block ads, set timer to stay focused and keep track of your daily goals. Plus, graphs and charts measure your activity, site tracker measures time spent online, Gmail icon tells how many unread mails are there and messages change hourly to keep you motivated. 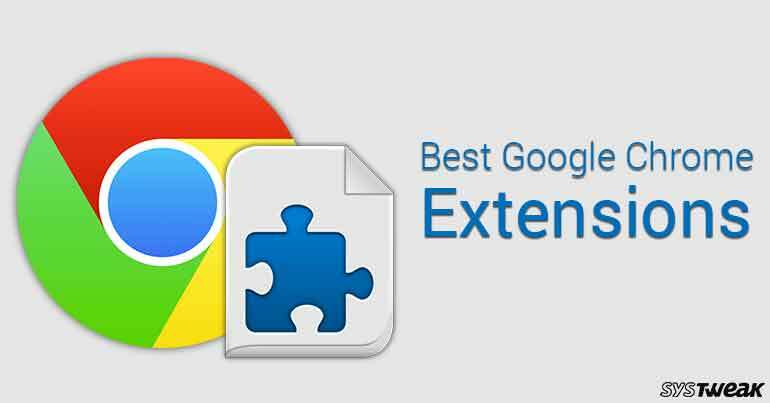 Looking for best Google Chrome extension to reduce data usage? You have come to the right place. Data Saver extension optimizes your page visits and decreases data usage. Once the extension is enabled, Chrome uses Google servers to compress pages you visited before by displaying the webpage. However, the pages you visit with private connections (HTTPS) or in incognito tabs will not be optimized due to security reasons. To look for the data usage click on the “Details”. Furthermore, you can use the extension on Android devices. To enable it, go to Chrome’s settings menu. If you want to delete the browsing and download history use Click&Clean Google Chrome extension. It is a convenient tool that helps you scrub all your online footprints so that no one can see them. You must be thinking what’s new in it as Chrome as all these features but Click&Clean brings all these features at one place and even deleted client-side Web SQL database to completely wipe your online traces from your computer. This Google Chrome extension enhances the built-in functionality of Chrome’s History tab, it gives it a better look and adds more control to easily manage and browse the web history. Not only this, using Better History extension you can merge, visit and view downloads from a horizontal calendar view. Furthermore, you can search history by page title or URL and can search the highlights text on a page or by site domain. If you want to clip the web pages to look up later use OneNote Web Clipper to clip the complete page or part of it. You can sync these saved pages across your devices and view them later. Not only this, you can cut the ads, adjust fonts, highlight text, or grab selected images and videos to view later in the OneNote app. Another in the list of best Google Chrome Extensions is Ecernote Web Clipper. Want to save things you see online for future reference? With Evernote you can save all that you want in Evernote account. With Evernote Web Clipper users can quickly and easily save Web content from their Chrome browser straight into their Evernote notebooks. Not only this, you can clip full articles or Web pages, and can also take screenshots, save as PDF, and markup content and images. Remember everything that you need to do with Any.do. It is one of the favorite cross-platform extension that people use to stay organized and do things. You can sync your tasks and checklists to and from your mobile devices and your desktop. You can also create new lists and reminders, easily organize with a drag-and-drop interface, add notes, share tasks and more, all from your browser and synced across all your devices. Getting and reading your favorite content on Amazon’s Kindle devices is now easy. Use Send to Kindle Chrome extension to send web articles, blog posts, news on your Kindle. You will only receive the text not the interferences like ads and banners. Furthermore, you can edit the author and title before sending the text for better organizations and can choose to archive content in Kindle library to re-download later. Managing online articles and research is a real problem for both students and writers. Cite This For Me Chrome extension allows create an appropriately arranged website citation for the APA, Chicago, MLA, and Harvard citation styles, which you can easily save or copy to the clipboard for use in your documents. Don’t have time to view your favorite posts? Save it to read later, put it in Pocket. This extension allows you to save articles, Web pages, images and videos for your reading or viewing at a later time. It even syncs the data automatically to almost all the devices. You can look at the content even when offline. For online convenience developers use link shorteners, that can be hiding anywhere. They are helpful in dealing with heavy URL’s but short links involve risk that can be used by cyber criminals to redirect the user to any site. Unshorten.link extension identifies such links, expands them and analyzes them for infections. Not only this, it even removes unknown tracking cookies from the URL. Replace your new tab page into personal dashboard. Momentum extension sets a new quote, message, photo daily on new tab, sets daily goal, keeps track of tasks, links widget for your favorite websites and offers various other features. Want to spend time intelligently and do something productive? Use Strict Workflow. This extension enforces a 25 min/5 min workflow. Meaning 25 minutes of distraction free work followed by 5 minutes of break. It helps you to stay away from viral social media sites where we spend most of our time. It automatically blocks the most popular time eaters such as Facebook, Twitter and YouTube. Once the timespan of 25 minutes is over it gives you a break of 5 minutes to access all that was blocked. This cycle runs in repetition. Focus and concentrate on work irrespective of your surroundings. Noisli creates the right environment for your to work. It helps you calm down and focus on work with mental clarity. It creates an environment where you can listen to your favorite sounds in the background and concentrate. The extension includes a timer and volume control. Unable to identify where your valuable time is wasted? Use StayFocusd a time saviour as it helps user to stay focused and limits the time you waste on browsing unproductive sites. It happens with most of us in morning we plan doing lot many things but by the end of the day we do everything else apart from productive work. StayFocusd helps to stay focused, it allows you to allot a time to visit a particular site. Once the limit is exhausted site gets blocked automatically and is inaccessible for the entire day. Plus, you can make a list of allowed site and restricted ones to make intelligent use your time. Reduce tab clutter with OneTab, it compresses the opened tabs into a list. When you want to access the tabs you can restore them individually or all at one. It helps to save upto 95% of memory as less tabs will be opened at a time. Plus, users can also easily export their tabs into a list of URLs or a web page for easy sharing. Multiple opened tabs make browser slow and sluggish, therefore they should be used in moderation to boost the productivity. The Great Suspender comes to rescue you from such situation, it keeps a check on the opened tabs and automatically/ manually unloads tabs each tab while retaining its favicon and title text that have not been used for a while from memory. When user needs then he can reload the tab by clicking on the screen. Visualize and block the invisible sites that track your online footsteps. It is the best privacy tool and helps to load pages 44% faster. It even allows to see advertising, analytics and social media tracking cookies, with the choice of disabling them. Want to know who’s tracking you online, use Ghostery a free browser privacy extension. Using it you can protect and collect all the information relate to those tracking your online activity data. In addition, you can allow and block trackers on websites you browse, and anonymize your data. Not only this, it also speeds up page load time by blocking the trackers responsible for page lagging. The extension also provides links to their privacy policies and opt-out options. The name itself is self-explanatory, this extension helps to hide and save all the opened tabs in a single click. If you get an unexpected visitor or want to hide the tabs this extension works wonder. Once you want to resume working on the same tabs you can restore them all. Plus, you can password protect the tabs to swiftly restore your session. LastPass is one of the best Google Chrome Extensions Having difficult time managing passwords of all your different online accounts, use LastPass. An award winning online password manager that saves your passwords and gives your secure access from anywhere. To use it you just need to remember the master password and leave everything else for LastPass extension to take care. LastPass allows autologin and syncs the passwords for you to use them whenever and wherever you want. Makes your browsing experience easier and more secure. Protect your passwords, payments and privacy with Abine’s Blur. It works as an all in one privacy protector extension for Chrome as the strong passwords created by user are stored and synced across all devices from desktop to iOS for ease of use. Not only this, it even includes a tracker blocking. Plus, the paid version also masks credit card details while making online purchases. Google Translate is an excellent tool that helps you translate text into multiple languages. When used as an extension, it helps the user to translate complete page with a toolbar button. It automatically detects if the text on site is displayed in different language and prompts to translate it automatically. So, here concludes the 1st part. We hope that these plugins help you. Do check out part 2 on our list of Best Chrome extensions.